Can we use the knowledge of environmental tipping points to manage natural resources more effectively and efficiently? Three decades of study have revealed dozens of examples in which natural systems have crossed ecological tipping points (or thresholds) as a result of human-induced stressors, such as overharvesting, habitat loss and pollution. The resulting shifts can dramatically alter ecosystem function and services to people and sealife reliant upon marine resources. Managing natural resources to avoid such tipping points is highly desirable because the social, economic and environmental consequences of crossing an ecological threshold can be severe and sometimes irreversible. 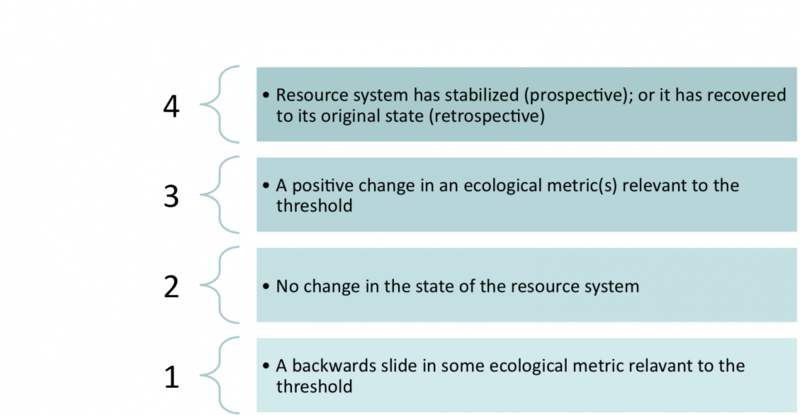 However, because our capacity to predict and manage abrupt ecosystem shifts is limited, the widespread incorporation of thresholds into practical management tools remains a tantalizing—but largely unrealized—goal. Using Ostrom’s social-ecological systems framework, we analyzed key biophysical and institutional factors associated with a set of 51 social-ecological systems and associated management regimes, and related these to management success defined by ecological outcomes. We categorized cases as instances of prospective or retrospective management, based upon whether management aimed to avoid or reverse a stressor-response threshold. 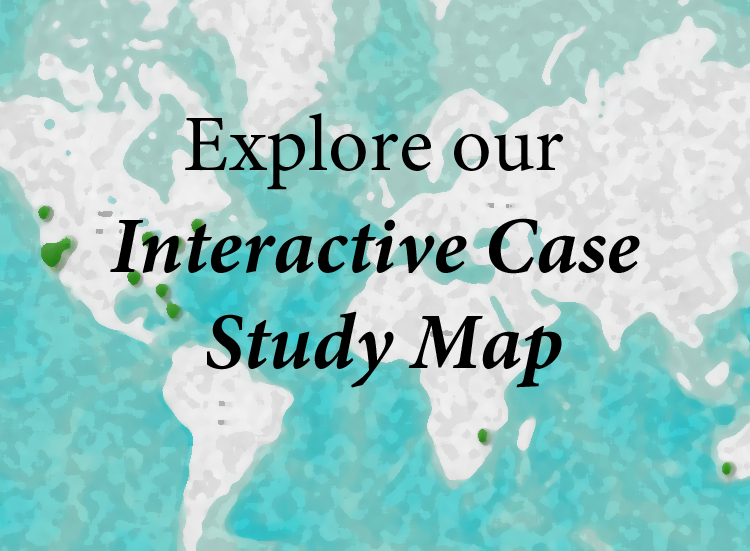 Following this global review of management responses to ecological thresholds, we created interactive stories of Management in Practice — highlighting through our interactive case study map examples of tipping points from around the world and sharing the stories of what happened, how managers responded, and what the outcomes have been. Two factors strongly correlated with success in both prospective and retrospective management: routine monitoring and explicit threshold-based management. This second finding—that explicit threshold-based management performs better than threshold-blind management—is powerful evidence for the policy relevance of information on ecological thresholds across a wide range of ecosystems. We use these findings to develop recommendations for managers seeking to ameliorate or prevent deleterious biophysical thresholds. Many marine ecosystems have tipping points, and managers might be able to achieve better ecological outcomes in a more cost-effective way by using these tipping points to make more informed decisions. 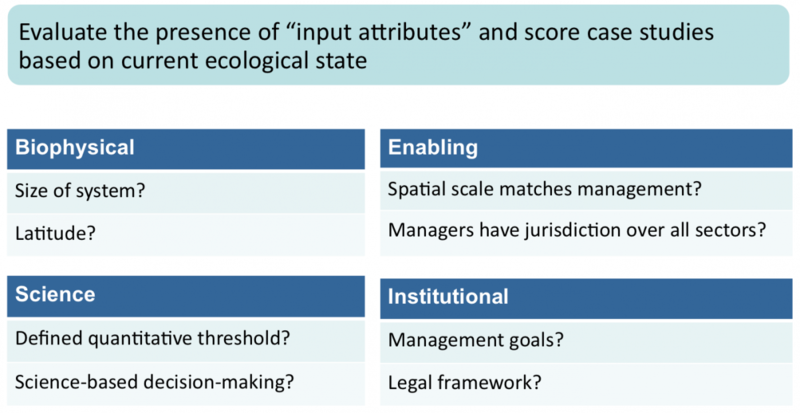 We undertook an empirical analysis of management decisions in threshold-based systems to find out, and to ask whether particular attributes of these systems make management more likely to succeed. We then used ordinal logistic regression and multivariate partitioning to search the resulting dataset for attributes that are strongly associated with successful environmental outcomes. Threshold management works. More explicit use of thresholds in management is strongly associated with better environmental outcomes. Responsive monitoring is key. Good outcomes are also associated with routine monitoring requirements in both retrospective and prospective cases. Scale matters. Threshold-based systems with smaller geographic areas are more likely to have good management outcomes. We are in the process of developing tangible policy recommendations based on these findings and will reach out to the management community to ground-truth our work. The immediate product of our work can be found in a peer-reviewed publication titled "Embracing thresholds for better environmental management" in the Philosophical Transactions of the Royal Society and is included in the November 2014 special issue on Marine regime shifts around the globe: theory, drivers and impacts that focuses on environmental thresholds. We are also considering the addition of a policy-oriented manuscript that further develops the design principles we identify as helpful to increasing the effectiveness and efficiency of threshold-based management. 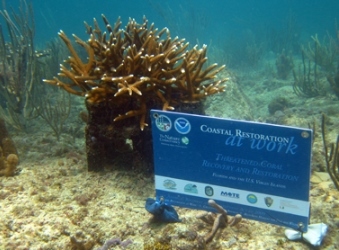 We are also engaging with resource managers and planners to share our results through a variety of media, meetings and workshops to co-develop ways to embed the findings into ocean management. This work serves as a foundation for other project outcomes and other future work by providing an overview of the current state of global threshold-based management practices in addition to revealing what attributes of the biophysical or social system can contribute to positive ecological outcomes.